"Pride and Prejudice and Zombies (stylized as Pride + Prejudice + Zombies) is a 2016 British-American comedy horror film based on the 2009 novel, Pride and Prejudice and Zombies by Seth Grahame-Smith that parodies the 1813 novel Pride and Prejudice by Jane Austen. The film is directed by Burr Steers, who wrote the adapted screenplay, and stars Lily James, Sam Riley, Jack Huston, Bella Heathcote, Douglas Booth, Matt Smith, Charles Dance and Lena Headey. The film was released by Screen Gems on February 5, 2016 in the United States, and by Lionsgate on February 11 in the United Kingdom and Ireland. The film grossed just $16 million worldwide against a budget of $28 million, making it a box office bomb." "In 19th century England, Colonel Darcy (Sam Riley) travels to the home of a wealthy family to investigate rumors of a newly infected zombie, revealed to be the house's patriarch. After Darcy executes him, he leaves before one of the young girls is devoured by the deceased's niece, now also a zombie. The Bennet sisters—Elizabeth (Lily James), Jane (Bella Heathcote), Kitty (Suki Waterhouse), Lydia (Ellie Bamber), and Mary (Millie Brady)—have all been sent to China by their father (Charles Dance) to learn in the art of weaponry and martial arts. Mrs. Bennet (Sally Phillips) wants her daughters to be married off to wealthy suitors. As it turns out, the Bingley family has moved in nearby and are throwing a ball, wherein Mrs. Bennet hopes that the young and handsome Mr. Bingley (Douglas Booth) will win over one of her girls. Elizabeth, on the other hand, doesn't want to seek a husband. At the Ball, Bingley instantly sets his eyes on Jane. When Elizabeth overhears a disparaging comment about herself from Mr. Darcy, she walks outside tearfully and encounters Mrs. Featherstone (Dolly Wells), now a zombie. After Darcy kills her, A horde of zombies then attack the party, prompting the Bennet sisters to fight them off. Mr. Darcy instantly becomes smitten with Elizabeth when he witnesses her in combat. The Bingley sisters invite Jane over for tea at Netherfield. Mrs. Bennet forces her to go on horseback, thinking she will be invited to stay overnight due the oncoming rainstorm. While on the ride, Jane encounters a zombie. Her gun backfires leaving a bite-like wound on her hand. She kills it but then is attacked by another. At Netherfield, Mr. Darcy orders her confined to her room, in fear that she may have been bitten. The Bennets are visited by Parson Collins (Matt Smith), who intends to marry one of the sisters. He tries to seduce Elizabeth, and proposes to her, but states that she must give up her life as a warrior, something that she adamantly refuses to do. Mr. Collins later decides to settle with Elizabeth's friend Charlotte (Aisling Loftus). After Jane recovers, the sisters attend another ball thrown by the Bingleys. There, Elizabeth meets a soldier named Wickham (Jack Huston), who seems to be charming and polite. He tells Elizabeth that he has history with Mr. Darcy and does not wish to further challenge him. Another group of zombies attack the party, resulting in Bingley injuring himself, and Mr. Darcy joining Elizabeth in fighting the horde. Elizabeth travels with Mr. Wickham to the In-Between, an area outside of walled-in London but inside a royal moat, to a church filled with zombies, who feed on pig brains to keep themselves from going completely savage. Mr. Wickham wants Elizabeth to join him in helping the zombies. He also suggests that she run away with him, but she remains conflicted. 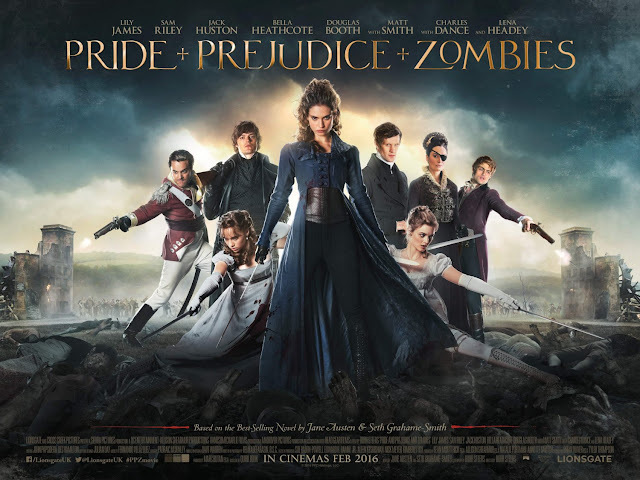 Elizabeth and Mr. Wickham then meet with Mr. Darcy's aunt, Lady Catherine de Bourgh (Lena Headey), a notorious zombie killer with major authority and wealth, to try and persuade her to come to peace with the more ""civilized"" zombies. Mr. Darcy and Lady Catherine blatantly refuse. When she arrives home, Elizabeth is told that Mr. Darcy has convinced the Bingleys to move away. When Mr. Darcy approaches Elizabeth with a proposal of his own, she expresses her outrage at his actions and fights him in a duel. Offended by her accusations he leaves. Mr. Darcy writes Elizabeth a letter to apologize for his actions and to state that he separated Jane and Mr. Bingley for fear that Jane only wanted to marry Mr. Bingley for his wealth, having overheard Mrs. Bennet drunkenly mention it. Mr. Darcy also mentions that Mr. Wickham had tried to elope with Darcy's fifteen-year-old sister for her fortune. Mr. Darcy's letter states that London has been overrun by zombies. Elizabeth is then cornered by Lady Catherine and her bodyguard Wilhelm (Ryan Oliva), who had intended to marry her daughter off to Mr. Darcy. After Elizabeth overpowers Wilheim in a fight, Lady Catherine decides to protect Elizabeth's family and takes them to her estate. Elizabeth joins Mr. Darcy in London and helps him battle the undead. Mr. Darcy encounters Mr. Wickham at the old church and rescues Lydia in the basement. After Mr. Darcy switches the pig brains with actual human brains, turning the zombies into savages, he escapes with Lydia. While heading for the last bridge from London, Mr. Darcy and Mr. Wickham fight once more with Wickham gaining the upper hand. While fighting Mr. Wickham, Mr. Darcy impales him and reveals a bite mark on his chest, revealing Mr. Wickham has been undead all along. Before Mr. Wickham can kill Mr. Darcy, Elizabeth rides in and chops Wickam's arm off and knocks him unconscious. Mr. Darcy rides with Elizabeth across the bridge as the army destroys the last remaining bridge to keep the zombies trapped within the In-Between on the inside of the moat. Mr. Darcy is injured in the explosion and is rendered unconscious. Elizabeth tearfully admits her love for him. After Mr. Darcy recovers, he finds Elizabeth and they share their first kiss, agreeing to marry. The two have a joint wedding with Mr. Bingley and Jane, officiated by Mr. Collins. In a mid-credits scene, the now one-armed Mr. Wickham is leading a horde of zombies toward them."